The search for a better travel pillow can seem like a Sisyphean task — even given the sheer amount of crowdfunded and Shark Tank-er products designed to help you travel in comfort that seem to emerge every day. So BuzzFeed Reviews set out to find the travel pillows that will truly make your tiresome trek as pleasant as can be — and if you're looking to invest in the very best one money can buy? Keep on reading. You may be surprised that there aren’t that many expensive travel pillows out there. Or maybe you think, like us, that people who are in the market for a luxury travel pillow just end up traveling in first class instead. For the rest of us back here in coach, though, the Cabeau Evolution S3 is our pick for the best splurge-worthy travel pillow. The original Cabeau Evolution pillow was already one of the best memory-foam U-shaped pillows on the market. The materials are high-quality, the design is great for all neck sizes, the memory foam is pleasantly firm, the case is washable, and it packs down tightly. It was even Wirecutter’s runner-up pick. But the recently released Cabeau Evolution S3 is a significant improvement on that already-excellent pillow, with a few key features that make it worth the extra cost and make it our high-end pick. The “S3” stands for their patent-pending Seat Strap System, which is one of the features that we think makes this pillow a winner. 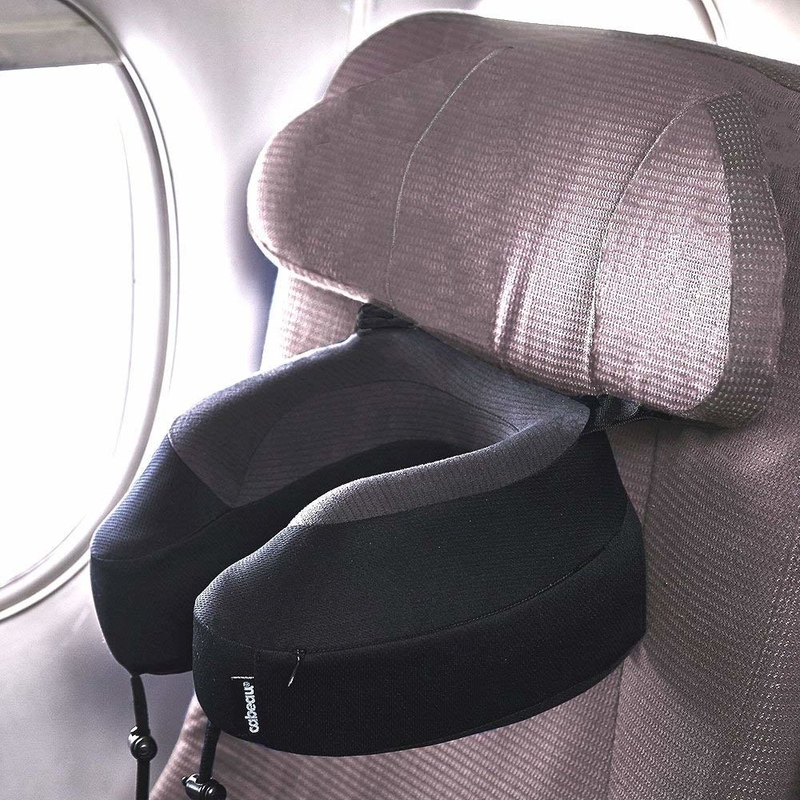 The adjustable straps on the back of the pillow attach to the wings of an airline seat headrest in multiple ways, which keeps the pillow — and your head — steady and aligned throughout your journey. While not all airplanes or trains or buses have wings on their seats, we think they are common enough to make it worth the gamble. Pair those straps with the adjustable front clasp, and this pillow offers superior support even for the floppiest of necks. While the shape is still a classic U, there are a few small improvements that set both the Evolution and S3 apart from competitors: The back of the pillow is relatively flat, which keeps your spine more aligned and flush with the seat. And the raised sides give extra support, even when your head is leaning to one side. The memory foam is dense enough to be supportive, and while the raised sides did bump up against large headphones, the flexible foam didn’t add a lot of pressure or make them uncomfortable. The material on the S3 is also more comfortable — in a variety of temperatures — than the earlier model. It’s marketed as a quick-dry high-performance fabric, and while we didn’t sweat enough in the ear region to fully notice and appreciate this feature, both the Evolution and S3 come with a removable and machine-washable case, unlike our other two picks. Sweaty neck-havers, this one’s definitely for you. One of the best features of the Evolution and the S3 is that despite the large, comfortable size of both pillows, they compress to become incredibly compact in their included travel bags, which makes them super portable. In fact, they pack so tightly that it took a couple minutes for the pillow to get back to its original size when unrolled (though not so long that it was annoying). Several reviewers mention that the zipper on their compression case broke, and while we did not have that experience in testing, most reviewers, as noted above, also report getting a replacement easily when purchased directly through Cabeau. While we still haven’t found a travel pillow that feels as good as the lay-flat comfort of the first-class elite, the Cabeau Evolution S3 is the closest thing to true ergonomic luxury we can find. 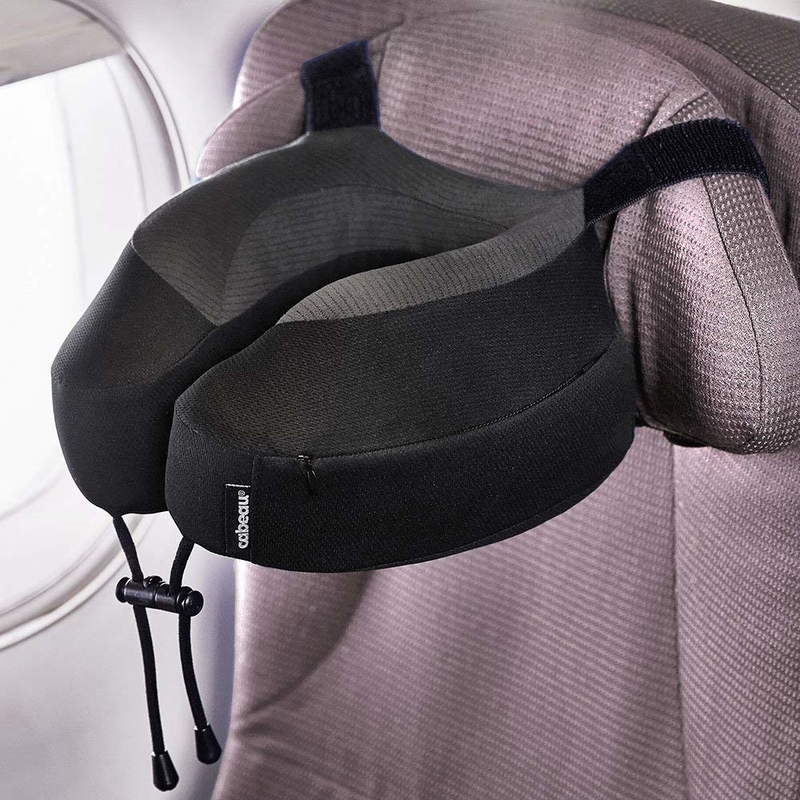 And check out all our picks for best travel pillow on BuzzFeed Reviews!